Gentle traction on the ureteral holding sutures pulls the distal ureters to the proximal end of the ileal segment. The ureters are spatulated for approximately 1 cm. Then 6-French single "J" stents are grasped by a laparoscopic right angle clamp, and inserted though the stoma into the conduit lumen. The right angle clamp tents the ileal loop at the desired ileotomy site. A laparoscopic electrosurgical J-hook is used to create the ileotomy and the stent is delivered into the abdominal cavity. The ureters are sequentially implanted in a standard Bricker fashion. 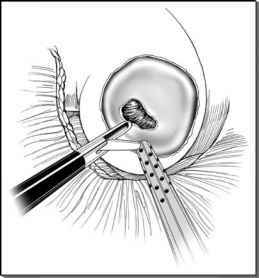 The apices are fixed to the bowel using three interrupted 4-0 poliglecaprone sutures. The remainder of the ureteral implantation is performed using a running 4-0 poliglecaprone suture. The stent is passed into the renal pelvis on each side when 80% of the anastomosis is complete (Fig. 2).